Is there a drought now? 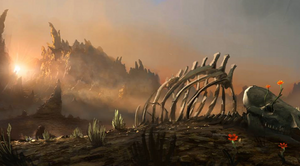 The Diablo Drought is a community name for a period of time in which very little new information is released by the Diablo III team. These periods may also include a lack of communication from the Diablo CM, Bashiok. The term "Diablo Drought" was coined by forum members in late 2008, after the hype of WWI 2008 and BlizzCon 2008 was fading rapidly. For a couple of months, almost no new information was released, and it was even added to DiabloWiki. The term has been used on occasion since then, and is a popular way of complaining about perceived lack of Diablo 3 news. It has been noted that Diablo Droughts have led to increased bickering among fans on the official Diablo III forums. Just how long must pass without new info for a "drought" to be declared is entirely subjective. Some fans are much less patient than others, and it's not uncommon for a week to start off with a blast of new info, and to see fans demanding more just a couple of days later. There's no clear guidelines or rule set for how often information should be released when a game is in development. Though early adapter fans want "more more more", the design team and Blizzard PR are aware that the total amount of people tracking the game at this point is a tiny percentage of how many will eventually purchase it. So while the team needs to keep the diehard fans from going crazy during these early days, they also have to keep in mind that it's a long development process and that giving out too much information too soon can backfire, when/if major game changes must be made. It's easy to see when information has been plentiful and lacking by looking at the Media Coverage of Diablo 3. This page was last edited on 19 March 2010, at 16:57.